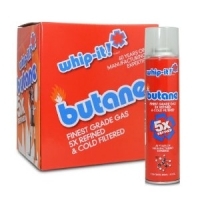 Whip-it 5x butane is one of the best grades of butane there is. This case contains 12 cans of 300ml. Pros: The case of Whip It I bought from you guys is the lowest online. Comments: Thanks guys for the great service, my product got to me quick and no problems.